The Audit Bureau has made some revelations about the 40-container hard currency LC fraud case (Photo: Audit Bureau). The Tripoli-based Audit Bureau has named and referred those responsible for the Benghazi port 40-empty container hard currency fraud case. The oversight body has frozen the bank accounts of individuals and companies accused of being behind the case. It also blacklisted the exporting foreign company. The action comes after the case became public last month and after the Audit Bureau had formed an investigation committee into the case. The Audit Bureau has named the individuals behind the alleged crime as Abdulrazag Ahmed Ishtewi aged 50 and his son Abdulfatah Abdulrazag Ahmed aged 25. Their three Libyan importing companies were named as the Libyan Al-Dawahi company for Food Imports, Wadi Al-Hai for Construction and Real Estate Investment, and Basmat Al-Amal for Food Imports. However, while in November Benghazi port personnel had reported the LC fraud at around US$ 8 million, the Audit Bureau reports that the LC opened was in fact for only US$ 500,000. They were supposed to be for the import of 800 metric tonnes of sugar priced at US$ 625 per tonne from Turkey. The Turkish exporting company was named as the Green Medina City for Food Trading. The Audit Bureau also revealed that the LC had been opened through the Sahary Bank, Corinthia branch and that the accused Libyan individuals / their company also held other accounts at Al-Ijmaa Al-Arabi bank, the Al-Nawran bank and the Sahary bank. The LC was approved by Sahary bank on 9/5/2017 and approved by the Central Bank of Libya (CBL) on 3/5/2017. In its statement, the Audit Bureau commented that the actions of the accused owners of the company have all the hallmarks of cross-border organized crime, as they found that they owned companies inside Libya that were responsible for the opening LCs for the sole purpose of importing undervalued containers to transfer hard currency funds to their offshore accounts. This was done in cooperation with other companies outside Libya to receive these funds for their benefit, the Audit Bureau added. The Audit Bureau also revealed that the named individuals had a track record in that it had already discovered manipulation by them through a Dubai-based company, the Right Path for General Trading. This company, the Audit Bureau said, was proven to be complicit in fraudulent LC transactions and was barred by a previous Audit Bureau decree in 2015. The Bureau said that the accused had been responsible for previous ”offences of manipulation and fraud”, and that they ”have repeatedly shipped suspicious containers”. In its statement, the Audit Bureau saluted the efforts of all the Libyan anti-corruption seizure and control agencies that have contributed to the detection of these crimes, but added that it was deplored by the persistence of this type of corruption, which targets the powers of the state and the strength of the simple Libyan citizen. It lamented the continuation of these LC crimes more than two years after the it had shed light, issued warnings, and made submission of proposals and recommendations to various stakeholders. The Audit Bureau also warned decision makers that every day of delay in taking the necessary action to address this problem – which in its view is caused by the existence of a black-market exchange rate and bank corruption – will further exacerbate the crisis and loss of control of the ability to fix it. 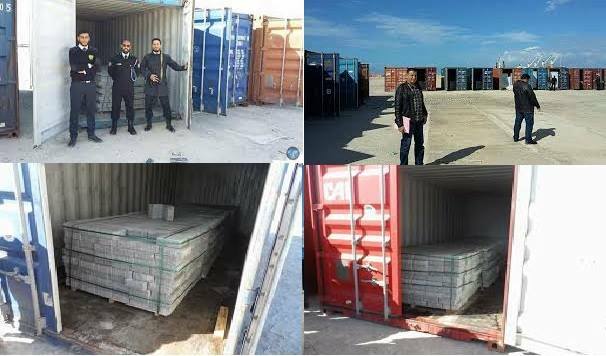 It will be recalled that in November, Benghazi port authorities had announced that they had discovered 40 containers loaded with underpriced imported goods as part of a US$ 8 million LC hard currency fraud scam. The authorities had not named any company or individual at the time, but had said it had been referred the case for further investigation and legal action. The LC import fraud case continues a trend that has become prominent since the 2011 revolution that toppled the Qaddafi regime and dismembered the Libyan state apparatus. The authorities said that the containers were supposed to be full of sugar, but instead contained bricks, bottled water, and a sample quantity of lentils and canned tomato paste. With the weakness of state security, monitoring and enforcement agencies and with the black-market price of hard currency shooting through the roof – at about seven times its official rate – the LC financial fraud scam has become common. Insiders had told Libya Herald that many Libyan import companies are being set up overnight, in conspiracy with corrupt bank employees, for one-off hit-and-run transactions. The Serraj-led GNA has set up a committee that is supposed to vet companies applying for LCs, however, fraudsters are still beating the system. It is to be kept in mind that the failure to import adequate quantities of reasonably priced essential goods such as sugar have led to prices rocketing at a time when Libyan consumer’s purchasing power is diminishing. Libya is also running acute budget and balance of trade deficits and is making up the state revenue shortfall by fast exhausting its hard currency reserves. On another level, a leaked Audit Bureau letter directed (in reply to a received letter) to House of Representatives (HoR) Finance Committee head Omar Tantoush dated 03/12/17 accuses the HoR member of being implicit in the LC fraud committed by the above indivduals and their companies. They accuse him of trying to intervene on the accused company’s behalf in a Tunis meeting. The very critical letter also accuses Tantoush of compromising his neutrality by spending too much time at the Tripoli-based CBL.